Be the first to share your favorite memory, photo or story of Robert (Bob). This memorial page is dedicated for family, friends and future generations to celebrate the life of their loved one. Robert (Bob) Joseph Fulham passed away March 13, 2019 in McMinnville OR. He was born in McMinnville on January 13, 1924 and raised in Sheridan by his parents Joseph and Ella (Lectband) Fulham. After graduating from Sheridan H.S. in 1942, he entered the Army in 1943 and served three years during and after World War II. He guarded German prisoners of war at Camp Clinton in Clinton Mississippi before being transferred to Belgium with the US Army Engineering 698th Petroleum Distribution Company. After returning home he settled in McMinnville and met the love of his life, Jacqueline Joy Bidwell at the Imperial Skating Rink in Portland. They married and had three boys. Bob and Jackie enjoyed dancing, roller skating, playing cards, camping, fishing, traveling, and collecting things. Bob worked 39 years for Davison Auto Parts as a machinist before retiring in 1987. Bob and Jackie enjoyed traveling in their motorhome after retirement. 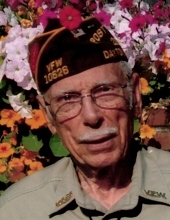 Bob was a member and one time president of the VFW as well as serving in the Honor Guard. Bob and Jackie were members of the McMinnville First Christian church where Bob was a Deacon and a member of the choir. Bob was preceded in death by his wife Jackie in 2004, sister Joelle Wesley-Fulham, and brother General Donald Fulham. He is survived by his sister Alice Fulham-Willis of Lincoln City, sons Ron, Jim, and Rich, six grandchildren, and five great grandchildren. Memorial Services will be held at Macy and Sons in McMinnville on Friday, March 29 at 11:00 AM. Donations in his name can be made to the VFW Post 10626, Dayton OR. To send flowers or a remembrance gift to the family of Robert (Bob) Joseph Fulham, please visit our Tribute Store. "Email Address" would like to share the life celebration of Robert (Bob) Joseph Fulham. Click on the "link" to go to share a favorite memory or leave a condolence message for the family.